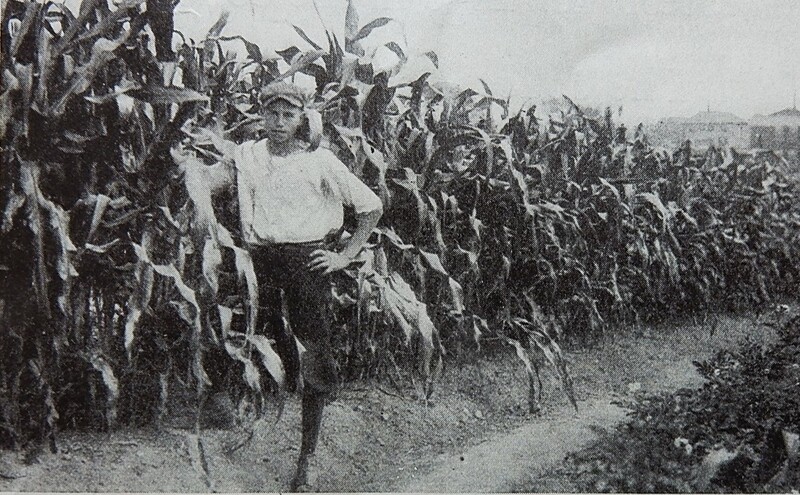 Photo caption: The first year the garden was all corn and potatoes. The pupils first wrote letters to the men who owned unused land near the school, incidentally finding out how important English composition is in the business world. Permission to use the vacant lots having been granted, enthusiasm ran high. It was winter, and the only thing that could be done was to measure the ground-which every boy and girl did- and then draw plans. The land was rocky, and the first thing to do when spring came was to clear it of stones and rubbish. This work took more time than was expected so planting plans had to be changed. Potatoes and corn were the only crops the first year. The breaking of the land having been accomplished, the next winter brought greater plans. The flower garden, beside the fence and bordering the vegetable garden, was 5 feet wide band 1200 feet long.The vegetable garden was divided into twenty-three plots. 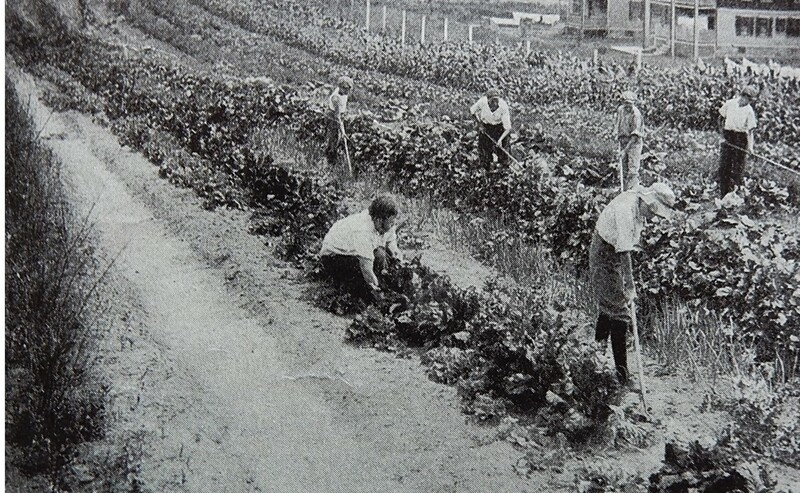 Photo Caption: The second years they grew all the common and some of the uncommon vegetables. The time spent in the garden could not be taken out of school work, and the children counted it as a “privilege” to begin school at half-past eight, that they might have the extra half hour in the garden. 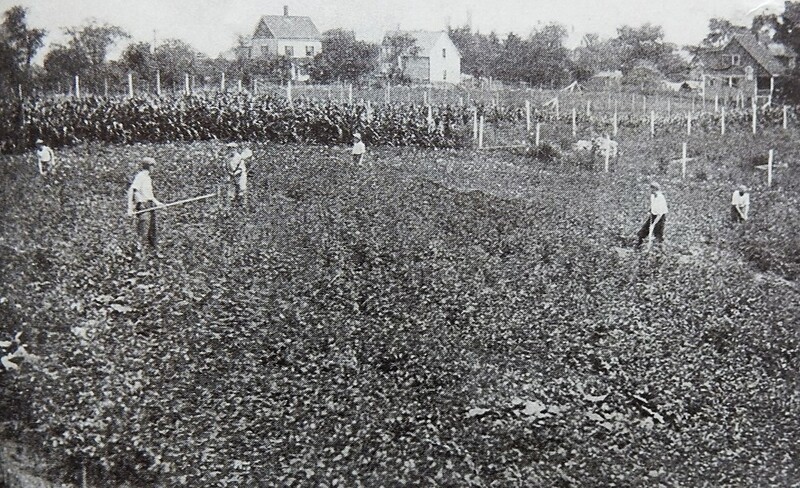 During vacation thirty-one pupils took charge of the garden, and were paid from three to four dollars a week. Everything was for sale at reasonable rates. One could walk around the garden and say, “I should like this head of lettuce,” or “that cabbage,” or could wait at home for the visit of a boy or girl with a little cart of fresh vegetables and flowers. Photo caption: Gardening included training in salesmanship. Corn was sold by the foot. My, how times have changed! It’s difficult to imagine school children actually working in a garden these days. Of course, for my mom’s family, this would have been no different than working in the fields on their farm at home! Good point, many children worked very hard on their family farms. This is wonderful. We have some small farms (or very large gardens) in the area that encourage participation by children in their planting and upkeep. While not part of the school curriculum, they do provide a similar experience. One woman I know says she had about a dozen kids last year who would come out and work after school, three days a week. If schools offered more opportunities like this, I suspect there would be more response than they might imagine. It sounds like a wonderful opportunity for the children. I think you are right that many students would like to participate in school gardening projects if it was available. Who knew? That was a very big garden. I did a very small school garden and the kids loved it. Carrots became very exciting. What a lovely post! I enjoyed that. Normally I don’t notice what folks wear, but I was surprised that many of the people in the photos were wearing hats. Thanks! I also thought this was interesting. I totally agree about the importance of getting kids excited about school. Student engagement is so important. That’s such a fantastic story. These days, school gardens are more common, at least at primary level, but often they’re about encouraging wildlife (also a very good thing of course) rather than growing the next meal. It’s wonderful to hear that you liked it. Both kinds of gardens can provide kids with fun learning opportunities that teach them important things. Interesting how things come full circle – many schools here have student gardens to help them understand where their food comes from. I also have a similar sense that student gardens are becoming more popular. The purpose for having school gardens may have changed somewhat over the years, but it’s wonderful that schools are once again utilizing gardens as a teaching tool. There is so much that students can learn from this activity. Thanks for this interesting post. Interesting how every aspect was a learning of some sort. And lessons in economy! When my son was young he always had his own small garden. There is still a little triangle of chives in a corner of the garden where he planted and hoed. It’s nice to hear that you enjoyed this post. I can relate to how your chives remind you of your son. My daughter planted a mint plant in my garden years ago. Over the years, it’s spread to cover larger and larger areas. She hasn’t lived at home in years, but I still refer to it as her mints plants. Wonderful story Sheryl. It’s good to know emphasis was on growing, cultivating and learning about nature way back when. Those ideas continue and I know of other such wonderful gardens in our school systems today. Thanks! I’m glad you liked it. I found it really interesting that they had gardens at schools back then. That was a lovely story! My older granddaughter who is in kindergarten this year, also has a school garden and loves to work there. It’s wonderful to hear that you liked this post. Kids really enjoy having opportunities to garden and do other hands-on activities. Such a wonderful project. Unfortunately, today something like this is likely to require filling hundreds of forms, insurances, health codes and what not. If there’s something that’s definitely got bigger over the years, it’s bureaucracy! Sigh. . . you may be right. It’s too bad when bureaucracy interferes with learning. This is so cool that there was such a large garden for the school way back when. I would think some schools located in very rural areas might even do this today. Thanks so much for sharing this, Sheryl! It was a wonderful opportunity for the students to have fun while learning important knowledge and skills. Like you, I think that school gardening is once again becoming popular. I’m familiar with some suburban schools that have gardens–and maybe even a few urban ones have them if they have the space. We need more of this in schools and little less fake math. School gardening can provide a fun and valuable learning opportunity for kids. I have seen school gardens, but this one looks like a farm garden! Wish the schools did more of this. Wish my yard wasn’t so shady so I could have a garden!! If only we made better use of our resources this way. We could be so efficient, effective, and not so harried if we planned it all out better. They really tried to provide students with practical knowledge and skills by providing the gardening experience. I agree. It seems like the students would have enjoyed working in the garden. Great archive! This is a concept still applicable in today’s school. It’s wonderful that schools are implementing similar concepts now. 🙂 This does sound like something students would enjoy. This is such a cool idea!! I hope that our (currently abstract) children someday get to work/play in a garden and learn how to grow and appreciate healthy foods. I remember when I was in school we started growing carrots in a pot and then we took them home to grow in our own gardens. What an interesting post. Your comment reminds we of how we used to start marigolds in a pot when I was in elementary school. The plants always seemed really special when I brought them home to plant in my mother’s flower garden. How interesting and resourceful! I wish more schools had gardens today…I think it would be great for the students to learn how to grow their own food! There was a lot of interest back then in providing students with opportunities to experience the curriculum, and learn practical knowledge and skills. Fascinating post. I think we need to return to times when children are taught the ordinary old life skills of growing plants as well as all the techie stuff. Interesting too that the article comments on the language skills learned from writing letters – so true. It’s awesome how they learned language skills, math, science, etc. while doing the school gardens. Kids enjoy learning experiences where they can be active. They did have a lot of really innovative ways of instructing students back then.